Gain Capital which filed its first S-1 over a year ago has renewed it again month and a half ago and now it finally put a price on it. According to WSJ Gain intends to sell 11 million shares for around $190 million and will have a total of 31 million shares after the IPO. This means that at best scenario Gain Capital values itself at just $535 million – roughly half of what FXCM does. Gain’s revenue is roughly 45% lower than FXCM’s however count on fancy accounting methods to make Gain appear much more profitable. Looking at the numbers we can see that FXCM kept a relatively steady level of profitability – around $100 million net income before taxes in 2009 and 2010. 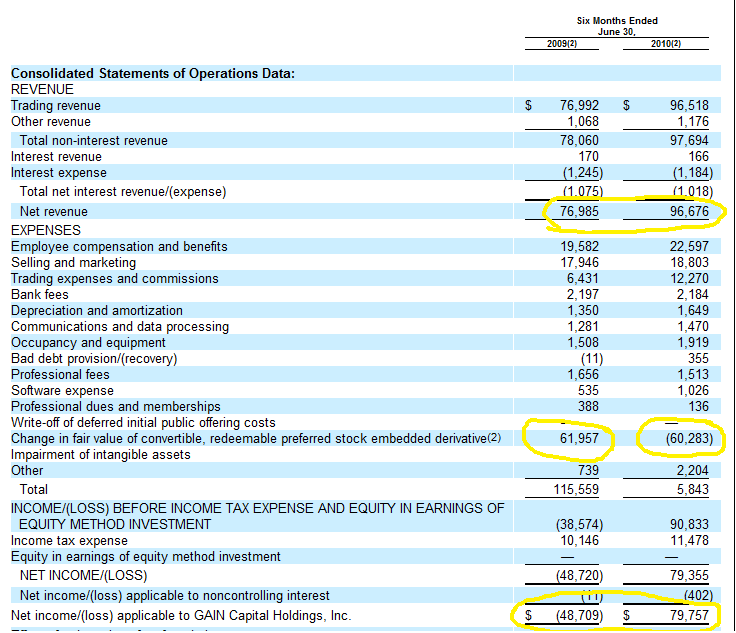 Gain however displayed a net loss of ~$50 million on a revenue of $77 million in the first half of 2009 but amazingly showed a net income of $79 million on a $97 million revenue. How is such profitability possible even in the highly profitable forex market you ask? The answer is pretty simple, or not, and is called “Change in fair value of convertible, redeemable preferred stock embedded derivative” which added $62 million to Gain’s expenses in 2009 but removed $60 million from Gain’s expenses in 2010. I have no idea what means so help me God, but all I know is that it turned Gain into a very profitable company in 2010 while the income and expenses haven’t changed that dramatically from 2009. The clock is ticking on both companies and FXCM which announced its pricing this week has only one more day left to complete its IPO, if it intends to do so this week. I’d say FXCM’s chances are much better than Gain’s so if FXCM fails this will also pull the plug on Gain’s high flying hopes. It would also be a huge blow for this industry if both IPOs fail as retail fx strives to break it into the mainstream and having a few public companies amongst its ranks will only help it to achieve this goal. The other interesting IPO that might happen some time soon is FxPro. Trust Oanda that it monitors this situation very very closely for several reasons. the embedded derivative is linked to the Jan 2008 repurchase deal done with 3i. Yes it makes earnings ridiculously volatiile, but once the IPO occurs, this derivative expires. I think you’re a bit too focused on the embedded derivative, as it is not a systemic indicator of earnings related to business activity. The derivative is related more to valuation. Read the entire S1. This is simply an accounting issue that is caused due to the selling of preferred shares as part of fund raising – all of this will go away once the company is public and I can’t see this being done on purpose to project a larger company than Gain really is.